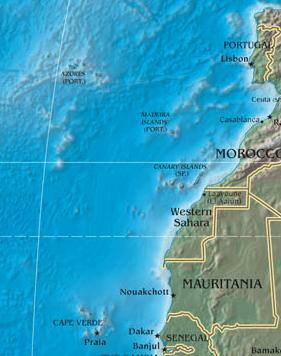 The Canary Islands chain is one of a group of five situated in the central Altantic Ocean. The others are the Azores, Madeira, the Savage Islands (part of the Madeira Autonomous Region) and Cape Verde. Collectively, they are known as Macaronesia, which is Greek for "islands of the fortunate". Out of all these island chains, the Canary Islands have the greatest variety of endemic flora. Indeed, it is the fourth greatest in the world. There are in the region of 1700 plant species, of which more than 500 are endemic to the islands. Regarding fauna, there are over 6000 species of invertebrates and nearly 110 of vertebrates. Not all these are natural inhabitants, however. Some were introduced by humans. There are six major zones of vegetation on the island, according to altitude and directional aspect. Sea level - 700m. A xerophyte is a plant adapted for growth under dry conditions. This area of Tenerife is ideal for them. Examples include spurges, cactus spurge and wax plants. 200 - 600 m. A "thermophile" is described as an organism that thrives at a temperature of 50° or higher. This is an area of moderate temperatures and rainfall and has been adversely effected by human activity. It contains many endemic species such as juniper, palm trees and the famous dragon trees. This is a zone characterised by frequent rainfall and mist. Many large trees, with abundant undergrowth of bushes, herbaceous plants and ferns. Plants such as laurels, holly, ebony and mahogany are much in evidence. 1000 - 1500 m. Much dryer, with less species, but important nonetheless. Examples of wax myrtles, tree heath and holly. Open pine forest, with thin, unvaried undergrowth. Examples of Canary Island pine, broom and rock rose. Dry climate, strong sunlight and extremes of day and night temperatures. Flora well adapted to the conditions. Many endemic species here. An area of great scientific importance. 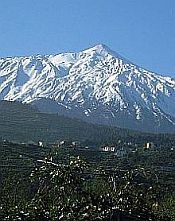 Examples of endemic flora include Vipers bugloss, Teide white broom and Teide violet. There are quite a few animal, invertebrate and bird species endemic to Tenerife, but I know I'll have to be careful here. In the pages whose links are given below, I might inadvertently include a species that isn't truly indiginous. If so, I apologise, but this information is given in good faith. Remember - I'm not a scientific expert! Tenerife Insects - some of the more exotic ones! There is also an abundance of animal and plant life, both in Tenerife's surrounding ocean and its inland freshwater pools. Although Tenerife is not noted for its freshwater, there are numerous reservoirs and water tanks throughout the island, plus pools of freshwater gathered in such places as caves and lava tubes. These environments have their own collection of species.